Reach Communications supports worship event for over 90,000 at the Texas Motor Speedway. 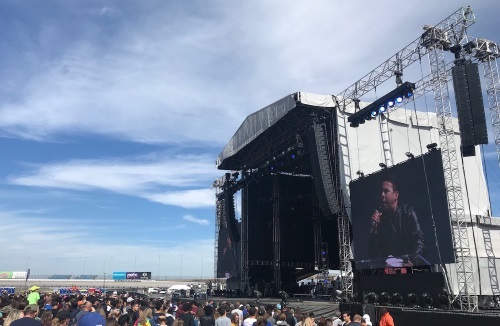 Reach Communications recently provided sound reinforcement for the Pulse ‘Together’ event with over 90,000 in attendance using NEXO STM line arrays at the Texas Motor Speedway in Dallas. For ‘Together’ Dallas, the NEXO configuration consisted of 18 M46/B112 and 1 M28DF per side, 24 RS18 Ray Subs, 16 S118 subs for the main PA, and 12 M46/B112 and 2 x M28DF per side for outhangs. 15 M28 were used for delays, 12 M28 for far delays, and 8 GEO M10 for frontfills. 50 NXAMP 4X4 amplifiers and 1 4X2 Mk 2 (for M10 frontfills) powered the system that was all controlled through NeMo, NEXO’s system management software. On stage, Reach used 16 PS15-R2 stage monitors/side fills, 2 RS18 Ray Sub side fills, and NEXO 2 Msub15s for drum subs.